... I'm going to show you some true treasures. And my mother will be blushing. 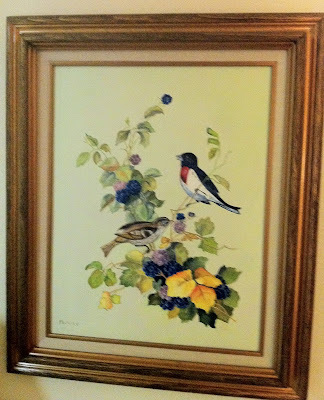 When my mother was in her fifties, she took art lessons. There are many, many more pictures, particularly of birds, but I will show them to you at a later date. The last picture in this list is of the road by their country home they called, appropriately, WHITE HAVEN (my maiden name is White). It's in east Texas and is on the land my daddy's grandparents homesteaded, and where he would love to go as a child. In the mid-1970's Daddy bought it from his uncle, and he and Mother built a home there. They lived there for 27 years, till they moved to the Metroplex, to be close to me. Those pictures that Mother painted really look better in person.... but I wanted to show them to you. Here's another picture, not of a picture she painted, but of a 'hobby' Mother has. 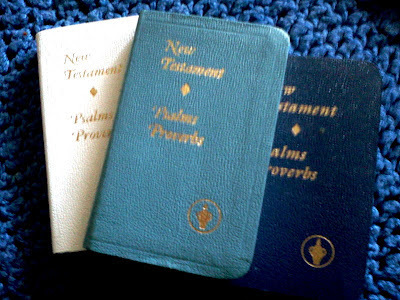 Mother always keeps little Gideon Bibles in her purse. My dad was a Gideon for years and years (Press HERE and HERE (the Wikipedia entry on it) to find out what that means, in case you don't know). Mother was - and is still - a part of the Gideon Auxiliary. Marina moved from that house that day to near Mesquite. I need to find her.... though I know she has a different last name now. It's a small world, isn't it? And it's a wonderful world. I'll show you more of Mother's pictures later... when I take better pictures! 1. You're never too old to take art lessons, or lessons of any kind (well, maybe not football lessons). 2. Share your faith when you get a chance, and excitement might happen! If you haven't taken my latest poll (upper right), please do. Thanks! I don't think I knew she took art lessons when she was fifty. So cool! I like her paintings. The birds are my favorite!! We are so lucky and fortunate enough to have that last one of WhiteHaven displayed proudly in our dining room. What an honor! She is very talented!! I love the bird paintings too, Susan!! That's pretty talented for a woman who "started" art in her 50!! Fun story about the old BVmember, too!